Hey guys! 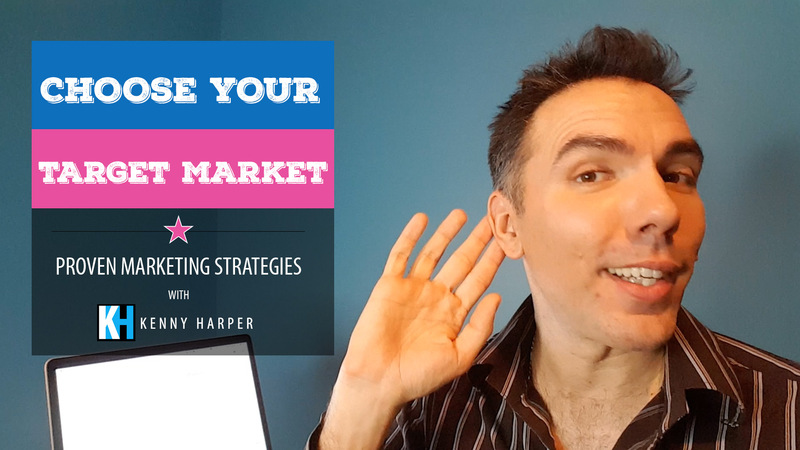 Kenny Harper here and right now I’m sharing Choose Your Target Market. If you’ve been in business for a while, you’re gonna go “uhh, duh, I kind of know that“. Here’s the thing. Most people kind of know that, but they’re missing some opportunities. It is common for people to understand… all right well we serve this demographic, we serve these types of people, we help them with these problems, and here’s the benefits that we offer. We move them away from this pain and move them closer to this pleasure. But here’s the thing. A lot of the times people will still say we can help anybody. … We can help anybody. You see problem? If you’re saying that you can help anybody, then you’re really saying you can help nobody. It’s not very clear who your target is. So when you choose your target market, you don’t have to get married to it right? You don’t have to do that. You can actually just use campaigns putting out your message to the right people at the right times. For instance Jen DeVore Richter. She is a rockstar professional. We do a lot of stuff together. One of the cool things we did this year is we put on event or a DR Horton. They’re connected with realtors because they want to stay in touch with them. We did a joint venture with DR Horton that we would put a personal branding workshop together and we would present it out to the realtors. Now when we did this, we didn’t just say “Hey it’s a personal branding workshop and it’s good for anybody“. We said this is the personal branding workshop for realtors and we took the content that we typically would provide to a lot of different business professionals and we’ve refined it just a bit so it spoke directly to the audience that was there, the realtors. Now this had rocking success. If we hadn’t taken the time to really refine the message, to put it out there so it was specific to the target audience, it wouldn’t have been nearly as successful. Another example is Jay Henderson, who took his product, customized it to his audience and had some amazing results. He said it was just all about really making sure that it was resonating with the people so when the intended audience heard it they where like “This is for me, this is my stuff”. Think about your message when you’re putting stuff on social media or when you’re putting out marketing campaigns or if you’re directing traffic to a particular webpage. Think about are you really making sure that message is resonating with your ideal customer, with your target market. Or do you need to do adjust it just a little bit further to get a little bit better results… or maybe even a lot better results. If you have any ideas or if you have any questions I’d love to hear from you. Remember sharing is caring. Not Sure About How To Define Your Target Audience? Look, I totally get it. It’s counter intuitive. If you communicate to a smaller niche group you may expect less return but actually opposite is typically true. Contact me if you need help identifying your Target Audience.